Is adjustable, so that you can set the height to rest your feet flat on the floor. 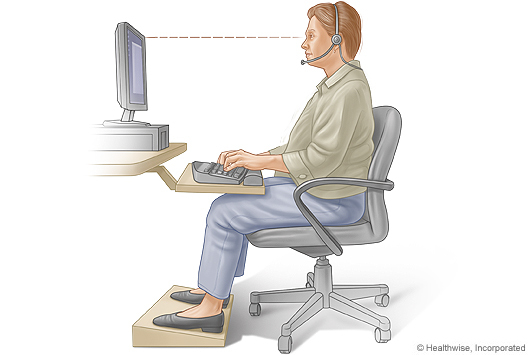 Keep your feet supported on the floor or on a footrest to reduce pressure on your lower back. Some people like to sit in a slightly reclined position because it puts less stress on the back, although this may increase stress on the shoulders and neck when reaching for items. Many keyboards and keyboard trays have wrist supports to help keep your wrists in a neutral, almost straight position. But wrist pads are just there for brief rests. They are actually not meant to be used while you are typing. But some people find the pads helpful even when they are using their keyboard or mouse. When you type or use your mouse, try raising your forearms a little so your wrists are in a neutral position and your arms and hands can move freely. If you have arm rests on your chair, you may be able to adjust them so your forearms are parallel to the floor and your wrists are neutral. Your wrist is in a neutral position when the thumb is in line with the forearm and the wrist is bent slightly back, such as when your arm is hanging at your side. You may want to alternate between resting your wrists on the pads and raising them up. If you use a wrist pad, it's best to rest your palm or the heel of your hand on the support, rather than your wrist. The tilt of the keyboard can be adjusted. Some people find in more comfortable if the keyboard is flat or tilted slightly down at the top. Try different tilt angles to see what is most comfortable for you.